Several types of metabasites of different age were identified in the southern part of Pezhostrov Island: eclogites with a magmatic protolith age of about 2200 Ma and 2500 Ma old metagabbroanorthosites that retained no eclogitic assemblage. It is shown that the Paleoproterozoic eclogites dominate volumetrically over Archean eclogites in the Belomorian eclogitic province. Eclogites with the youngest Jatulian protolith age (no older than 2200 Ma) occur with the same frequency as those with the Archean protolith age. A new find of eclogites with a Paleoproterozoic age of magmatic protolith and generalization of accumulated geochronological data confirm the recognition of an extended zone of high-pressure metamorphism with an age around 1900 Ma in the Belomorian mobile belt. Original Russian Text © S.G. Skublov, A.V. Berezin, A.E. Melnik, B.Yu. Astafiev, O.A. Voinova, V.I. 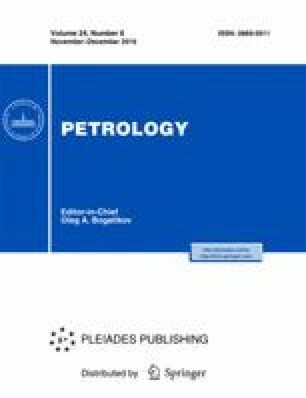 Alekseev, 2016, published in Petrologiya, 2016, Vol. 24, No. 6, pp. 640–653.